St Louis area new home construction activity continues to gain momentun with building permits issued for new homes for the period ended November 30, 2013 increasing 25% from the same period the year before. 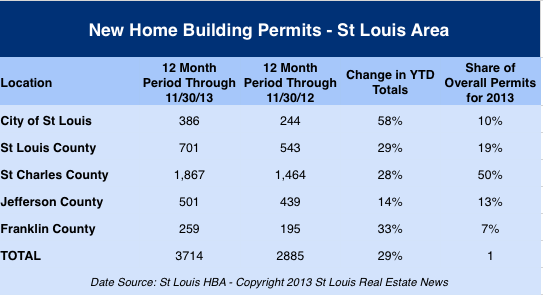 As the table below shows, all St Louis area counties saw increases in building permits for the period. Nationally, there were 577,000 permits for new single family homes issued for 2013 through November 30th, an increase of almost 21% from a year ago when the year to date total was 477,700 permits.